Matt told me about a great project that helps our firefighters. It's a program to benefit those brave guys/girls who risk their lives both in fighting fires and with EMS. 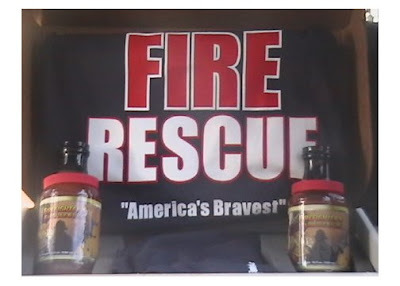 It's FireFighter's Barbecue Sauce as well as t-shirts and those neat wrist bands that get the word out about worthy causes. Firefighers Barbecue is now featured at the Albuquerque, New Mexico Fiery Foods and Barbecue Show. Sure wish I lived near there. I'd be there in a heartbeat. But, I'm way out in North Carolina, and that's a long road trip. In any case, the idea is that you can have a unique fundraiser with barbecue sauce (and the cool shirts and armbands). Isn't that much better than some of those awful things they send kids out to sell like dust catching knickknacks or popcorn that costs $15 for a mini can? Really, who doesn't love some good barbecue sauce? Count me in on that. I am pleased to say that I have never caught my grill on fire other than in the way intended. I did, however, I am sad to say, burn up a tree in my yard. I thought it would be too much work to try to get those limbs out from under that had sharp needles. The tree was evergreen, so I thought, "Hum. I'll just burn those gross brown limbs under the tree. Green stuff won't burn." Hello! That's not a good plan. The tree was a 100 foot or so tall and the fire went about double that. It was quite amazing. Take my word for that. I called 911 and got out the water hose. A policeman drove by and saw the problem and helped me water down the side of the house. The firemen were there in 5 minutes or so. One fire guy said, "Man, I thought that could not be a tree fire. We could see the flames and smoke across town." But, yes, it was that gross old evergreen tree in my yard that I always hated. They make really big and amazing fires - old pine trees of some strange sort. My brother, a landscape engineer, said it was some sort of special everygreen from China. All I know is that it cut my fingers picking up limbs and stopped up the lawnmower. The neighbor kids got in from school to see this smouldering trunk in my yard that was charred black. I told them a space ship landed on it (-: In a small town, your stories must be more interesting than just you set the limbs on fire under your tree and burned it all to heck. Since the firemen came fast, I did not burn my house down - about 30 feet away. I do not have to worry about those old limbs jamming up my mower now, since I sure killed that tree in the process. For my birthday (by request), the family came out and got that old trunk cut down and out of here. So, I say God Bless Firemen, and if you see some Firefighters Barbecue Sauce out there, buy some. You'll get some great sauce and help out a super group of folks who are there when you need them, although I hope you never do. I still get teased now and again about being "Sparky" and lighting up the whole town with my tree fire. It could have turned out really bad, but the firefighters were right on it and got that put out. I also have a cousin who is a professional firefighter. So, I have a real special place in my heart for those who put out our fires, and I promise to never again burn up a tree in my yard. Cross my heart.